Arches National Park contains the world's largest group of naturally occurring stone arches. The environment of this National Park is dry and generally barren, though it is sprinkled with eroded sandstone figures that have taken strange shapes over time. It is not uncommon for visitors of the Park to encounter fins, pinnacles, spires, balanced rocks, and arches, as it contains over 2,000 of these miraculous formations. One of the Park's most famous icons is Delicate Arch, which appears regularly on the magazine covers, tourism materials, nature photographs, and license plates. However, photos hardly do justice to the awe and splendor of visiting the arch in person. 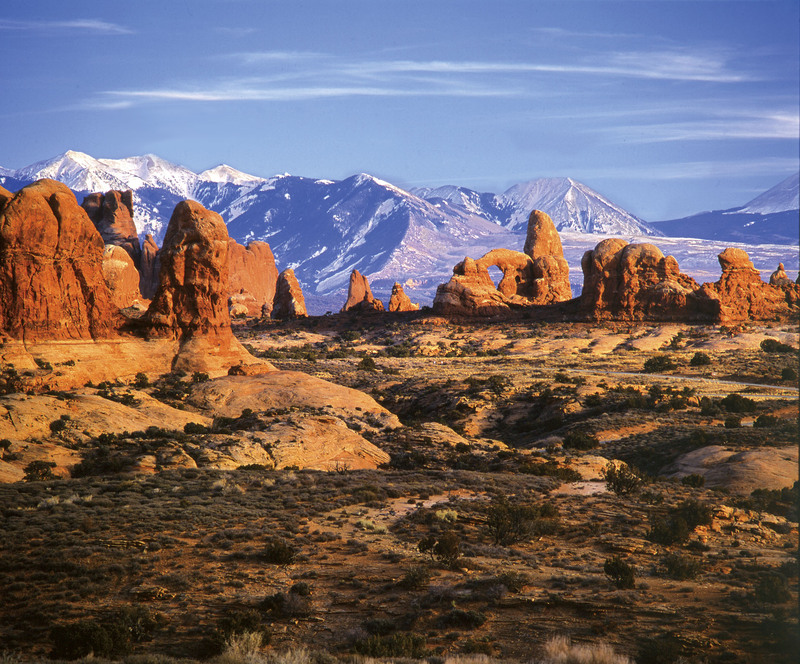 Standing under the arch offers hikers a view of stunning slickrock canyons and the beautiful La Sal Mountains, as well as the opportunity to witness the size and majesty of this "delicate" geological phenomenon. Another spectacular highlight of Arches National Park lies to the south of Double Arch. It is a section of sandstone that appears to be a herd of elephants out for a stroll. The rock formation has eroded in such detail that it seems as if the elephants are holding onto each other’s tails as they journey, single-file, across the desert. The few small arches within the body of the formation make it look as if someone intentionally carved the stone to take the form of these traveling pachyderms.